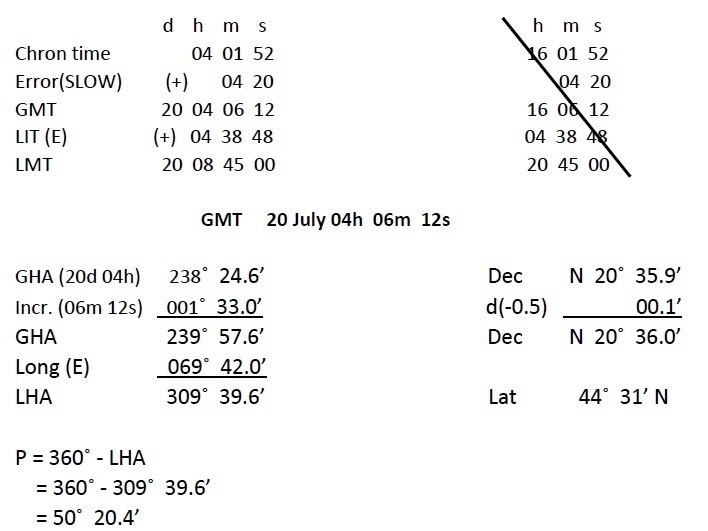 On 20th July 2008, AM at ship in DR 44˚ 31’ N 069˚ 42’ E, the azimuth of the sun was 100˚(C) when chron showed 04h 01m 52s. If the chron error was 04m 20s SLOW and variation was 8˚E, find the deviation for the ship’s head. Naming of A, B, C: A is named opposite to the latitude when LHA is between 270 & 90 and same as latitude when LHA is between 90 & 270. B is named same as declination. For C, if A & B are of same names, add and retain names. If of contrary names then subtract and retain name of larger one. Naming of Azimuth: The prefix N or S is the name same as C whereas suffix E or W depends on the value of LHA. If LHA is between 0 to 180, the body lies to the WEST and if it is between 180 and 360, the body lies to the EAST. Where, if error & variation are of same names then subtract and retain name. If of contrary names, then add and retain the name of the larger one. On 22nd Sept 2008, PM at ship in DR 18˚ 20’ N 085˚ 40’ E, the azimuth of the sun was 265˚(C) when the GPS clock showed 10h 09m 38s. If variation was 2˚W, calculate the deviation of the compass. On Jan 19th 2008, in DR 40˚ 16’S 175˚ 31’ E, the azimuth of the sun was 267˚(C) at 1618 ship’s time. If the ships time difference was 11h 30m from GMT and variation was 2.3˚E, find the deviation for the ship’s head. On 30th April 2008, in DR 00˚ 00’ 060˚ 12’W, the sun bore 080˚(C) when the GPS clock showed 11h 00m 52s. If the variation was 1˚W, find the deviation of the compass. On 31st August 2008, in DR 10˚ 11’ S 000˚ 00’, the azimuth of the sun was 282˚(C) when chron showed 05h 10m 25s. If the chron error was 00m 05s FAST and variation was 3˚E, find the deviation for the ship’s head.